How sure are you that the figure you met in the parking lot was an angel? For me, the parking lot Earth angel was real. I felt it in my heart…my core…my center…my truth, at least that’s how it works for me. Throughout Casey’s recovery, whenever I hit my lowest lows and plummeted to the depths of despair, God sent me a sign that He was with me, and provided the strength and courage I needed to carry on. Since it’s rare for God to make a personal appearance, I believe He sends His messengers to do His work. For me, faith isn’t built on the tangible; it’s built on the intangible, the unseen. How would you describe your religion? Many traditional Catholics in my town don’t believe in tarot cards, for example, and the ‘Catholic Plus’ members (who practice candle and herb magic) to my knowledge don’t work with crystals or tarot either. For me, embracing each day as if it were my last—being kind to others, sharing the joy and love in my heart with everyone I meet, standing in my truth, finding the positive in every situation, respecting others and their views without judgment, embracing the unlimited possibilities that life has to offer, exploring the unfamiliar, living authentically, staying in gratitude with every breath, and honoring my God, The Infinite, All That Is (however you describe your Higher Power)—has become my foundation. I’m not sure you would define it as religion: for me, it’s a way of living. How did your family react when you mentioned writing a book? I am blessed to come from an extremely loving and supportive family. My children and siblings were thrilled and have been my greatest cheerleaders throughout the process. What advice would you give people who are going through similar situations, or people who aren’t as blessed as you were to get time off of work for so long? Let love become the lens through which you see and embrace life, and allow gratitude to always be your silent prayer. How is your family now? Grief isn’t something that gets erased from your heart. Healing takes times. And even though the family has come to terms with our new normal, it doesn’t mean that we don’t ache for what was. Yet, we have accepted what is, moved forward, and embraced with wonderment the sweet miracles of life. You attended the international brain injury association conference last year. Has your son’s experience inspired you to pursue an education in neurobiology/brain trauma? Being more right brained than left brained, my son’s traumatic brain injury did not inspire me to pursue an education in neurobiology/brain injury. But it did inspire me to step out of my comfort zone and submit my abstract—A Mother’s Perspective: “A Ture Transdisciplinary Team”—at the International Brain Injury 10th World Congress in 2014. It was important for me to share from a mother’s point of view the combined efforts of all parties involved that created “A True Transdisciplinary Team”—members of different professions cooperating across disciplines to improve patient care through practice and research. In my case, my son’s recovery was based on the doctors and nurses: (1) administering the highest quality of care; (2) embracing the family’s nontraditional healing modalities; and (3) providing a powerful, positive, and supportive environment that enabled Casey to thrive. My abstract was well received by scientist and neurologist worldwide at the conference, who mentioned that the combined efforts (three points mentioned above) were vital to a patient’s overall healing process. Now, that’s inspiring! Will there be more books in the future? Yes. When you write a memoir, you have to stick to the facts. There is no wiggle room for creativity. My next book will be a novel. I am looking forward to stepping out of the box, knocking down the walls, and diving into the depths of my imagination, and beyond. What else do you want readers to know? I don’t believe any person leaves this world without enduring storms in life, some mild and some treacherous—loss of a job, divorce, terminal disease, addiction, and loss of a child or loved one… Yet it’s not the size of the squall that matters; it’s how we handle it that counts. Even though my dreams had been tossed and blown, I knew I had a choice—to surrender them or fight to keep them alive. I chose the latter. As difficult as it was to blaze through the gales blinded by the pelting rain, while dodging lightning bolts quaking at my feet, I marched on with hope in my heart. Cloaked in courage, faith became my guiding light. But at the end of the road I had another choice to make –to stay stuck in my grief or step into the life I was meant to create. 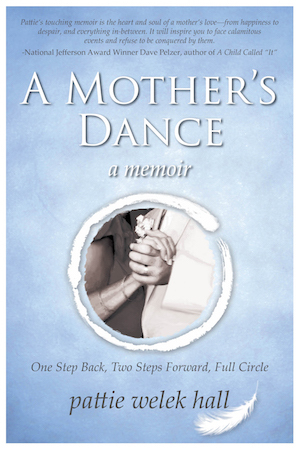 I hope that my story of a mother’s love, the sad and the wondrous, can inspire others to brave their storms. You host Joy Radio. Would you say that, or your writing career is more fulfilling? I don’t believe there is one road to fulfillment and happiness. There are many forks in the road that present themselves in life, filled with unlimited opportunities that can stretch a person to become more than they already are. If that happens, I say, follow that road, and the next… Joy Radio has allowed me to be of service to the world by promoting authors and others that inspire, educate, and empower through their life stories. And writing has allowed me to strengthen my creative muscle while having fun. Both enrich my life beyond my expectations, bringing great joy. And for that, I’m eternally grateful.